Q: How did you start your career as a professional organiser? A: I’ve been a bit of an organiser all my life really and I come from a family of extremely organised people. My house, my parents’ house & my 2 brothers’ houses are all particularly organised, which I think makes them calming and relaxing places to be, whilst still being homely. Mess and chaos makes people feel stressed, myself included! Professionally though I’m a qualified Project Manager. I worked at Virgin Media for over 20 years, managing large scale projects, which basically involved me organising what needed to happen, when, by whom and of course making sure we don’t overspend on the budget. I’ve also done a few property renovation projects of my own – transforming neglected flats into fresh, modern, attractive properties, making them more appealing and therefore easier & faster to sell. I guess organising is my thing, just like baking or playing a sport is someone else’s thing! So, when I was looking to set up a business of my own, becoming a Professional Organiser seemed the perfect fit. It’s big business in Australia, America and growing in London. But it’s still quite a new concept here in Scotland. Q: How long have you been at this? A: Help Organise Me is a brand-new business! I only launched in July of this year, but I feel like I’ve been preparing for it all my life. (Ha! I sound like a contestant on X Factor – but not as glamorous or scary!) I’m really enjoying the work – I get a great sense of satisfaction from organising people’s living and work spaces and hearing how much better they feel about their home after I’ve finished. Q: What kind of services do you provide to homeowners looking to organise their home in order to sell/move house? A: I can help with all aspects of a house move! First, preparing your home for sale. We’ve all seen the TV programmes on how we should present our homes to potential buyers to make them more appealing and easier to sell, but we don’t all have time to do what’s required. Each property is different, but generally I get called in to help declutter, depersonalise, clean & refresh a client’s home to make it look its absolute best before anyone comes to view it. I can also help with the actual house move. 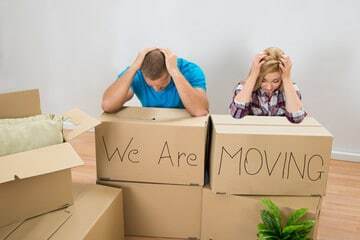 For those of us who have moved house before, we know there’s more to it than having a removal company to move our belongings. If only it was that simple! I can help take some of the stress out of the move. I can help find the right removal company, source new home insurance, deal with the utility companies, do your change of address notifications, arrange for your Broadband, Phone & TV services to be moved, take final meter readings, etc, etc. I can also help with the packing and unpacking so you can start life in your new home as you mean to go on – organised and tidy! Q: Who uses a professional like you and what do you bring to your clients? A: I can help anyone who has a property to sell which isn’t in ‘walk-in condition’. Most of us have jobs, families and busy lives, which makes preparing a house for sale a huge challenge, which we often don’t have time for. There’s also people who have inherited a property which is perhaps dated and in need of some TLC who can benefit from having someone like me to come in and transform it into something people want to buy. I approach each home with sensitivity – it’s peoples’ homes we’re dealing with. Lots of time, effort and money has gone into making these properties into a home, not to mention the memories which have been made there. I am non-judgemental and guarantee discretion and confidentiality. Q: Professional organising for someone who wants to sort out their home before selling – how does it work from a practical point of view? A: First, I’ll meet with the client in the property. Sometimes the client knows what they want done, they just need someone to do the work and if there’s any painting or maintenance to be done I’ll co-ordinate and oversee the tradespeople to make those improvements. Other times, clients need help working out what is required to make their house more sellable. In that instance, I’ll suggest improvements and together we’ll agree what needs to happen. In most cases a good declutter, a clean and ensuring each room has a clear purpose and is presented beautifully is what’s required. I can help enhance a room with lamps (good lighting is so important!) and some nice cushions and a throw, which I can bring with me. Q: What are your tips for a homeowner tackling house work? A: If you’re wanting to declutter (& who wouldn’t, right? ), I’d suggest you start small and pick a drawer in your house that is messy that annoys you most & tackle that first. You should complete the decluttering task in one go, so leave yourself enough time. Have bin bags to the ready. Take everything out of the drawer and bin anything that is broken or missing parts. Anything that you no longer use but is in good enough condition to give to charity, put that in a separate bag, marked for charity. Anything that is good enough to sell, you should keep that separate. I avoid selling stuff that’s likely to get less than £20, otherwise it can take up too much time, with not enough reward. Go through each item in the drawer, putting aside items you are going to keep. I always suggest you only keep what you love and/or need. Let go of everything else! Having too much stuff is what creates mess and mess creates stress. Get rid of the bin bags straight away – don’t leave them lying around your house. Wipe out the empty drawer. Use drawer dividers or small boxes to organise & store the items you’re going to keep, keeping similar items together. Make yourself a cuppa, admire your tidy drawer and congratulate yourself on a job well done! Then plan your next job!! It’s a simple process, which takes a bit of effort, but is SO rewarding. Once you’ve carried out this exercise around your entire house (I challenge you to do it!) you’ll find it so much easier to keep things organised and tidy. Your home will become your haven and you’ll be more aware & fussy about bringing new things into your home, as you won’t want to start adding clutter when you’ve spent so long decluttering. So, you can end up saving money too!